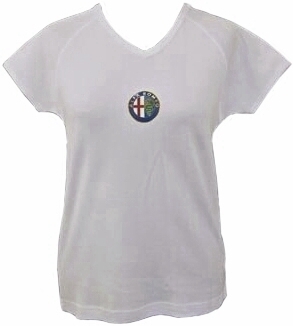 Alfa Romeo Ladies Skinny T-Shirt, White. This stylish fitted 100% cotton interlock shirt is both sporty and fashionable. Ideal for long journeys in your Alfa Romeo. Available in size 1 (34), 2 (36) & 3 (38). This is of course official Alfa Romeo merchandise.